Western Blot analysis of VPS53 expression in transfected 293T cell line by VPS53 MaxPab polyclonal antibody.Lane 1: VPS53 transfected lysate(73.7 KDa).Lane 2: Non-transfected lysate. Immunocytochemistry of VPS53 in 293 cells with VPS53 polyclonal antibody ( Cat # PAB13369 ) at 5 µg/ml. 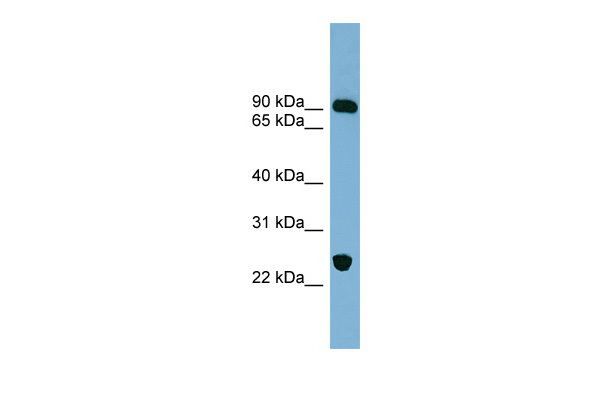 Western blot analysis of VPS53 in 293 cell lysate with VPS53 polyclonal antibody ( Cat # PAB13369 ) at ( A ) 0.5 and ( B ) 1 µg/ml. Western blot analysis of VPS53 in 293 cell lysate with VPS53 polyclonal antibody ( Cat # PAB13370 ) at ( A ) 0.5 and ( B ) 1 µg/ml. (LEFT) Western blot analysis of VPS53 Antibody (N-term) (AP18239PU-N) in MCF-7 cell line lysates (35ug/lane). VPS53 (arrow) was detected using the purified Pab. (RIGHT) Western blot analysis of VPS53 Antibody (N-term) (AP18239PU-N) in mouse brain tissue lysates (35ug/lane). VPS53 (arrow) was detected using the purified Pab. Western blot analysis of VPS53 in 293 cell lysate with VPS53 antibody at (A) 0.5 and (B) 1 ug/mL. Immunocytochemistry of VPS53 in 293 cells with VPS53 antibody at 5 ug/mL. 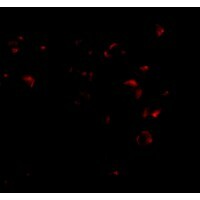 Immunofluorescence of VPS53 in 293 cells with VPS53 antibody at 2.5 ug/mL.